At that point, the nuclear arsenals of the U.S. and the USSR had hit a combined 60,000 weapons and were still growing. (Five new American nuclear weapons were being added each day.) A month after Reykjavik, in fact, the U.S. deployed a new B-52-based cruise missile system in violation of the 1979 SALT II Treaty. Hawks in Moscow were pressing for similar escalations. Elites on both sides — weapons manufacturers, intelligence and political establishments, think tanks, military bureaucracies, and pundits — were appalled at what the two leaders had almost agreed to. 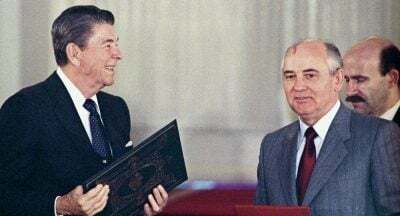 The national security priesthood, East and West, wanted to maintain what was termed “the stability of the strategic stalemate,” even if such stability, based on ever-expanding arsenals, could not have been less stable. Featured image is from Sputnik / Yuryi Abramochkin.